This little app includes all the tools you need to edit and retouch your photos, with advanced layer functions. 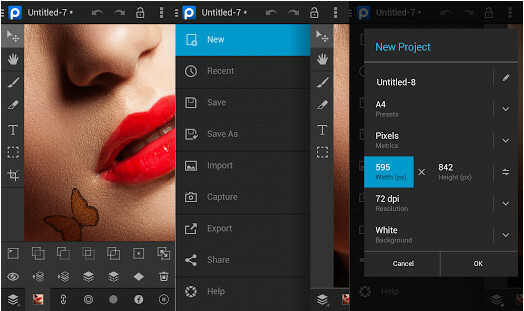 Download PhotoSuite 3 Photo Editor 3.2.309 Full Apk and become a professional!! • Improve your photos - crop photos, apply fine tone and color changes to get the best of your photos. • Work with picture filters and effects - Invert , Grayscale, Pointillize, Crystallize, Exposure, Posterize, Diffuse, Contrast, Displace, Kaleidoscope, Marble, Ripple, Block, Weave, Oil, Reduce noise, Sharpen, Edge. •New real-time filters such as Highlight Shadow, Pixelation, Sketch, Sharpen and many more. •Improved management of PhotoSuite projects. •Custom PhotoSuite camera that allows real-time preview of photos with filters (also available as Sony Xperia camera plugin). •New Smart adjustment of Brightness, Contrast, Hue and Saturation for each layer. •Magnetic transformation – ability to align layers and selections to work area border. •Flip and Rotate transformations via layer or selection dragging. •Real time preview of “Hand” tool applied to layers, masks or whole projects. •Real-time preview of Opacity and Adjustments. •Added Locked selection mode for creating square and circle regional selections. •Share-to-PhotoSuite dialog now allows users to insert in new or existing project. •Ability to choose whether to save a project onto Internal Memory or External SD Card. •Ability to evaluate a new version after update on Google Play is released. •Fix: Image orientation taken from media (if available). * Crop tool enhancements - ability to choose between standard aspect ratios such as 2, 1:1, 16:9 or to define custom crop aspect ratio.